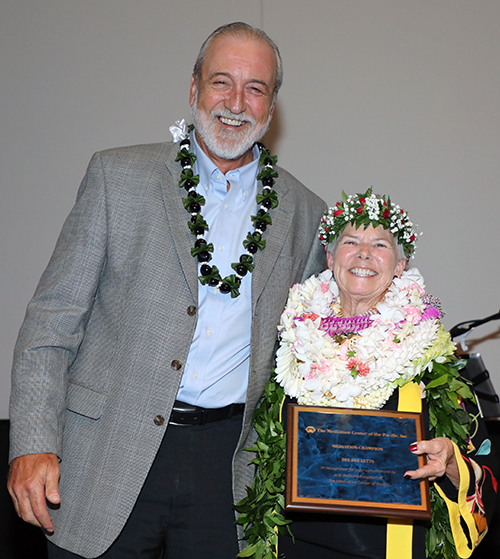 Steve Holmberg, MCP’s board president, presents Dee Dee Letts with the Champions Award. Congratulations to Dee Dee Letts, First Circuit Court Operations Specialist and head of the Judiciary’s Office of Project Management, who was named a Mediation Center of the Pacific “Champion” for her outstanding contribution to the field of mediation. She began her career in mediation in 1982 and later joined the Judiciary Alternative Dispute Resolution staff. Read more about Letts’ many accomplishments in the mediation field here. MCP Champions, from left, William Hoshijo, William Darrah, Bruce McEwan, and Dee Letts. 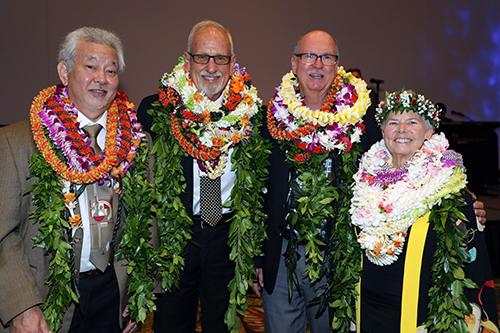 Letts, along with William C. Darrah, William Hoshijo, and Bruce McEwan, were honored as Champions on April 13, 2019 at MCP’s “Under the Mediation Moon” fund-raising event held at the Hawaii Convention Center.